Heat oven to 350°F (325°F for dark or nonstick pans). Place 24 cake ice cream cones into two mini-muffin tins. (This will keep them upright while baking). Fill each cone until just over half-full with batter. Bake 15 to 20 minutes or until a toothpick inserted in cake comes out clean. Cool completely before frosting. TO FROST: Fit a plastic pastry bag with a large star tip. Use a spoon to scrape some vanilla frosting up one side of the pastry bag. Fill the second half of the bag with chocolate frosting. 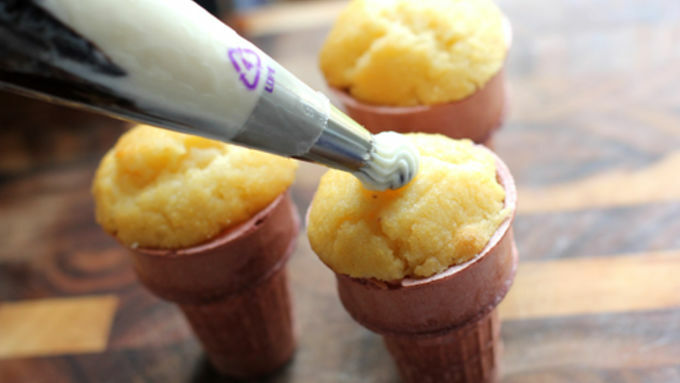 Twist the pastry bag closed, then pipe the frosting onto your cooled ice cream cone cupcakes. Top with a maraschino cherry & enjoy! 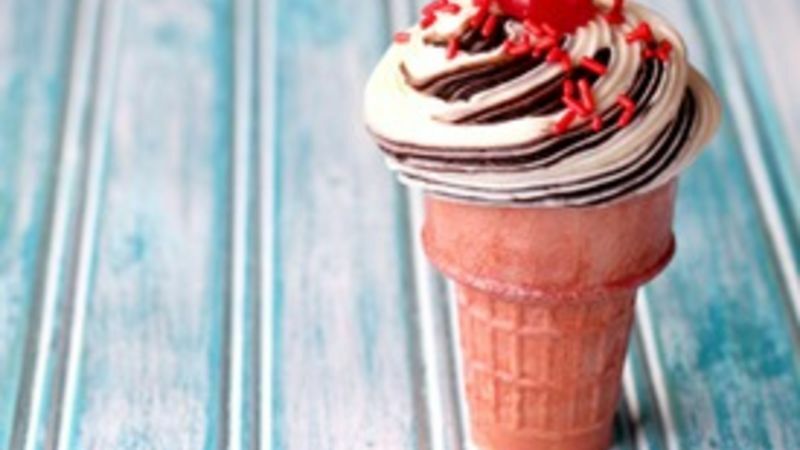 Ice Cream Cone Cupcakes are a retro classic! They are easy to make and uber eye-catching. A truly fun twist on your basic cupcake, without all the hubbub that normally goes into cleverly decorated cupcakes. To make our Swirly Ice Cream Cone Cupcakes extra-cool, we swirled together a batch of vanilla frosting with a bit of chocolate frosting to create a twist ice cream cone look. If you've never decorated cupcakes with this swirled technique, it may look complicated, but is actually quite simple. These Swirly Ice Cream Cone Cupcakes are a fun treat to bring to a birthday party or summer gathering. Have Fun with More Cupcake Recipes Check out our awesome collection of cupcake recipes! Here are a few of our favorites!